About a week after we returned from our adventure in Idaho, I got a call from my friend Peter, who wanted to know if I would like to ride with him along the Paciﬁc Coast from Albany, Oregon, back to the Bay Area. To that I responded, “Heck yes!” as my Idaho politeness hadn’t yet been rubbed off by the cruel streets of San Jose. Whew! That’s a lot of miles in a little time. For some, this kind of mileage is a piece of cake, and maybe it will be easy for us too. But I have a feeling this will be a pain and pleasure trip; the beauty of the Paciﬁc Coast will hopefully inspire us to keep on spinning. To help me keep moving forward as easily as possible, I decided I needed to raise the bar with my road touring setup. Carrie and I brought very little extra gear during our Idaho Hot Springs trip and the trip was a success. During that trip, I converted to a full set of bikepacking bags, which offer limited storage capacity but provide improved aerodynamics and weight savings compared to a traditional rack and pannier setup. 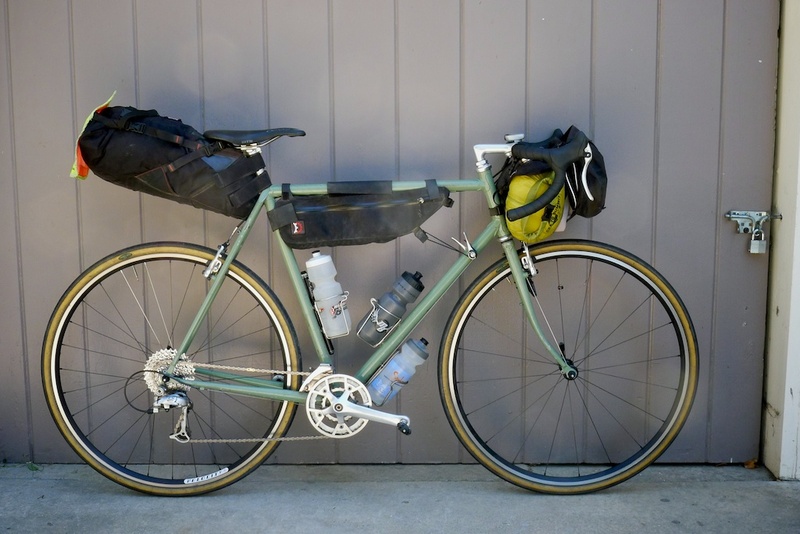 Instead of going back to a rack and panniers for this Paciﬁc Coast trip, I decided to use the same ultralight bikepacking setup on my road bike. One of the best aspects of using bikepacking bags is that they can easily be swapped from bike to bike. Click here to see my pack list for the trip. But during our Idaho trip, Carrie ended up carrying a majority of our food because all of my bags were maxed out. So for this trip, I needed to find a way to reduce the bulk of my stuff. The bulkiest items I carried were the sleeping bag, down vest, rain jacket, and tent. Of those four items, the tent was the obvious choice for volume reduction. Since Peter and I will be sleeping in separate tents, I have no reason to bring a two-man tent, much less a two-man palace that is the Six Moon Designs Lunar Duo. So I decided the best way to reduce the bulk of a tent would be to go whole hog and switch to a tarp and bivy sack. The benefit of this switch is that I can now fit my sleeping bag, ground pad, tarp, bivy sack, stakes, and one collapsing pole in the Revelate Viscacha seat bag. I will then be able to stash food in my small frame bag, in my handlebar bag, and in my jersey pockets.